If you’ve been following Matt’s playlists, you might know that he and his wife, Beth, welcomed their first baby, Nash Everett, this past October. 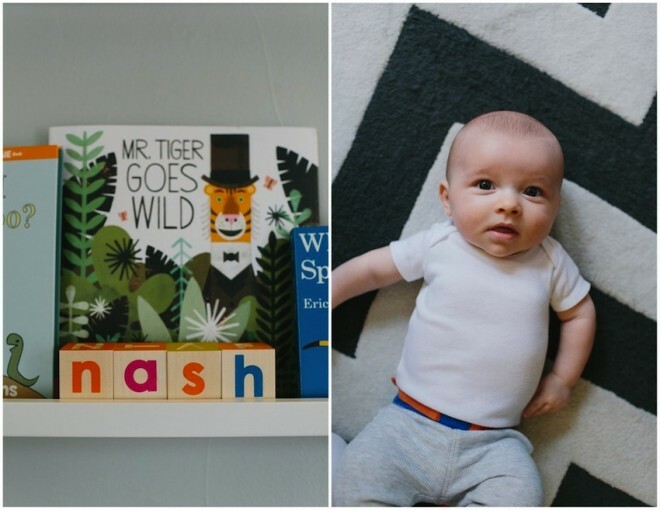 What you might not know, though, is just how adorable Nash’s nursery is! 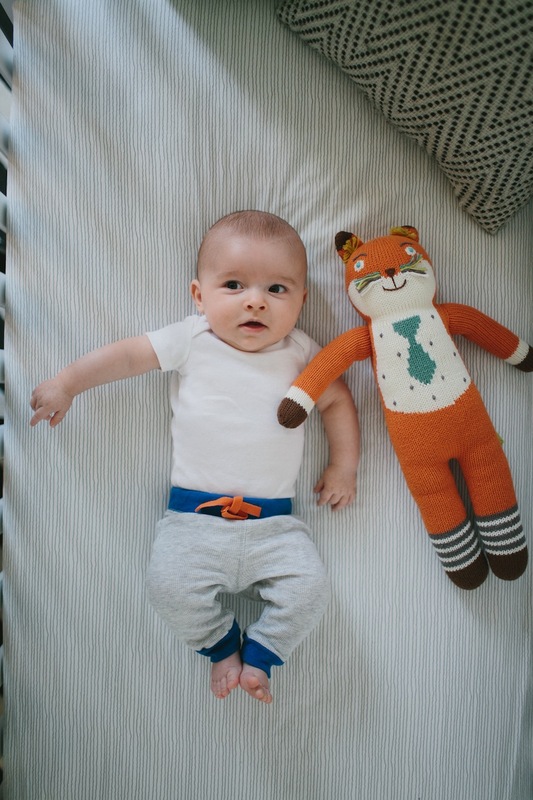 From the bright orange rocking chair to the handmade car mobile hanging above his changing table, Nash is one lucky little babe to get to crash in this Silver Lake pad! (His parents are pretty fortunate, too. Nash is a little dream baby who couldn’t be sweeter!) They were all kind enough to let us sneak a peek into their creative space one morning so we could capture all of the cuteness. Keep reading for Beth’s tips and tricks on pulling it all together… on a budget, no less! 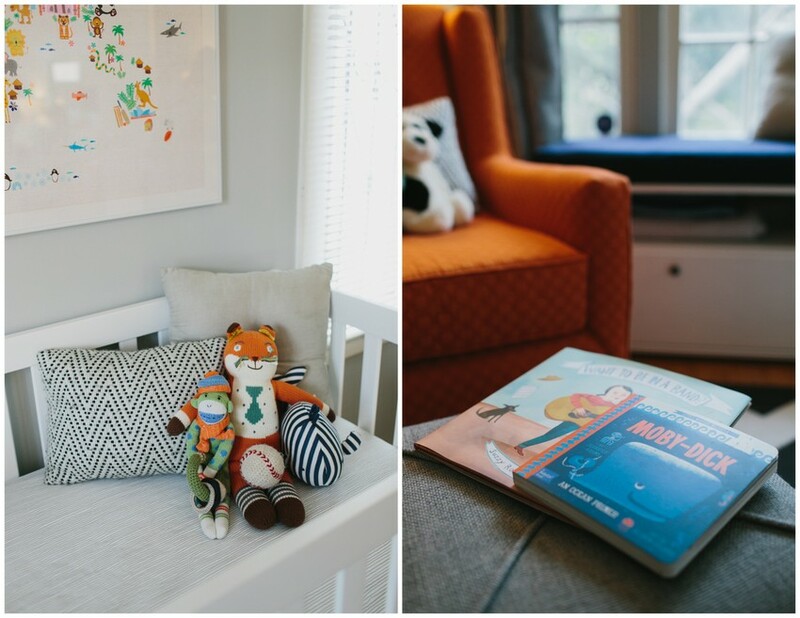 What was your inspiration for Nash’s nursery? We wanted his room to feel very “boy” but without the traditional boy themes that are so common. I knew I wanted the room to be somewhat neutral but with pops of color and bold patterns. I fell in love with the Animal Map of the World print above his bed and that served as some of our inspiration for the colors we chose. Tell us about the process… Where did you begin? Where does anybody begin these days?…Pinterest! I started pinning ideas for the baby’s room before I even knew if we were having a boy or a girl. I am in no way a stylist or designer, so I give my pinterest obsession a ton of credit in helping me piece together the room. Once I had established some key pieces I knew we wanted, it all kind of just came together! I can’t forget to give some definite props to my sister Kate, brother in-law Taylor, and my dear friends Jen, Aaron and Corrie, for letting me tap their painting and DIY skills. It was great to have a little extra help to get the room ready before little Man’s arrival. What was the most challenging piece in the room to make a decision on? The crib was tough. There are so many great and affordable options to chose from! But I would say hardest thing to choose was the bedding by far. We had it custom made so I literally had hundreds of fabrics to choose from. I had many pregnant sleepless nights debating on orange and grey fabrics and I drove Matt crazy with having him constantly look at options. I guess it was all worth it though because we love the way it turned out. 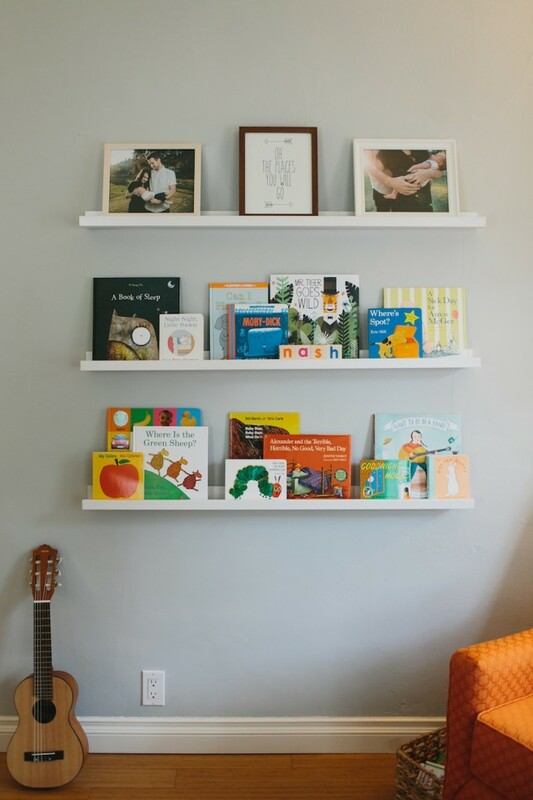 Did you and Matt have similar ideas for the nursery or was there some compromise involved? What is your favorite piece in his room? I love the orange glider. I feel like it’s kind of an unexpected color for a rocking chair. I love the way it stands out in the room against the light grey walls and white furniture. 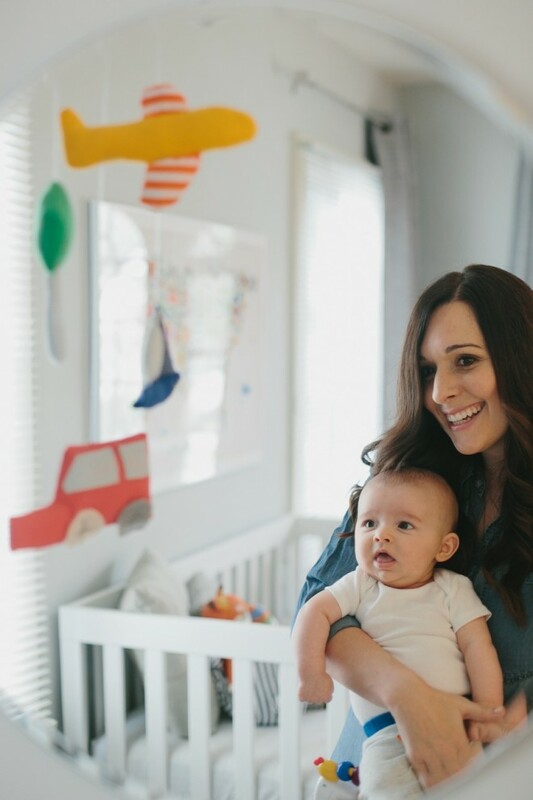 Any tips for expecting parents on building a functional nursery? For us, living in a smaller space in LA, it was important that the room be a place for Nash to both sleep and play. With this in mind, we opted for more affordable furniture that we wouldn’t be crushed over if pieces were chewed, scratched or colored on. 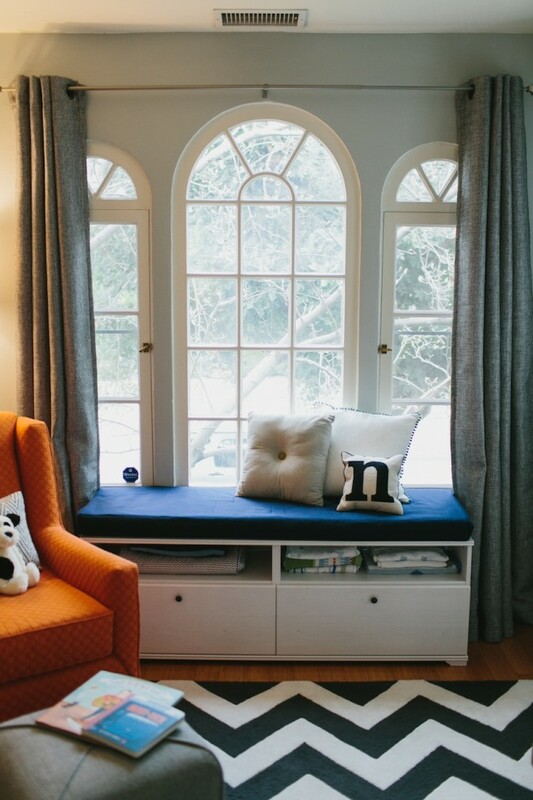 Also, I’ve seen many modern nurseries that go with a chic chair as opposed to a glider or rocker and for me, some sort of rocking chair is a must. It’s exhausting rocking your baby while standing up! Even at only three months old I think Nash knows that when we sit and rock together (in the obnoxiously orange chair =)) it is time to wind down and go to sleep. What has been your favorite part of motherhood so far? It’s so hard to pick one part! From watching my husband, Matt, become the amazing Dad I always knew he would be, to spending my days doing tummy time and changing diapers, it really is all so fun. One thing that is truly special is how much Nash knows and feels safe with us. When he wakes up first thing in the morning and calls/cries for us, it only takes me going into his room and saying his name once for him to calm, look over at me and smile. That is just the very best. And I have to say, all the cliche “momisms” are true! They grow so fast and you have to drink in every sweet moment. handsome baby and beautiful nursery…love your blog Jen! a lovely playmate for you little bundle of joy! Nana and Papa love sweet Nash, his beautiful mommy, and his amazing Dad! 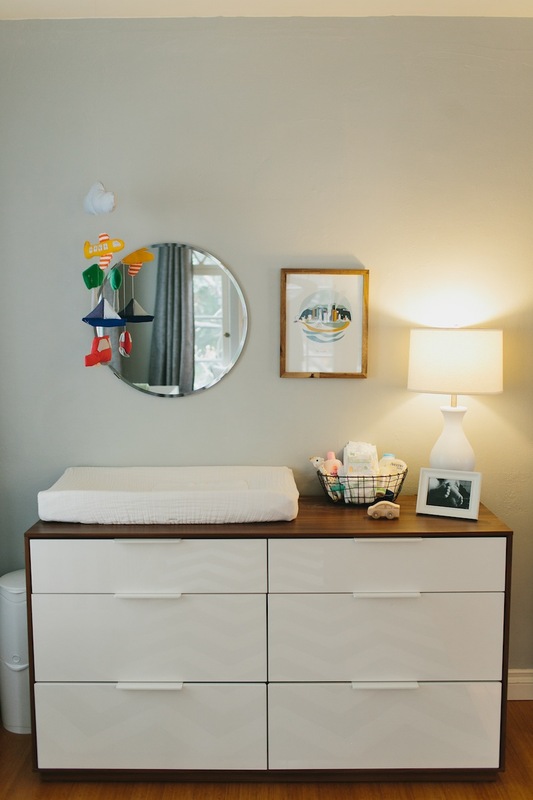 The nursery is a reflection of love and tender care. Thanks, Jen, for this post! Your blog is simply the BEST! Omg that is an amazing nursery! Thanks for sharing! Isn’t it the cutest?! Love that orange glider! such a beautiful nursery! I love love love the fox – can you tell me where it is from? thank you! I found your post on pinterest while I was browsing travel/adventure themed nurseries and fell in love with the map you used from etsy! I am sure this seems like forever ago, but do you remember what size print this is and where you found the frame to fit? (I am having a hard time finding frames that don’t have huge matting!) Thanks for your help! LOVE this. Well done. Do you know if the Animal Map of the World is the white or cream background? I’d love to know this too! It is slightly cream– definitely not bright white. Where is your ottoman from? Love it! Love the room! What size is the animal map print? Thanks! I’m not sure, Ali, but I believe there is a link to it at the bottom of the post! Hi! Your nursery is beautiful! 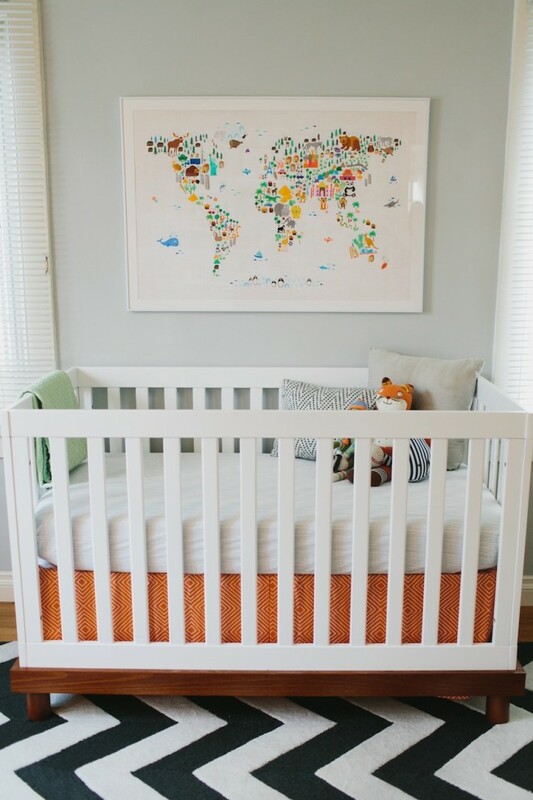 Where did you find the white frame/mat used for the animal world print above the crib? And what size is that? We’re having trouble finding a frame for that print? Thanks! May I ask what the dimensions of the animal map print and frame you used? Do you also have source of frame? I also have the same crib. It seems the perfect combo and scale. also looking for info on the frame and mat you used.